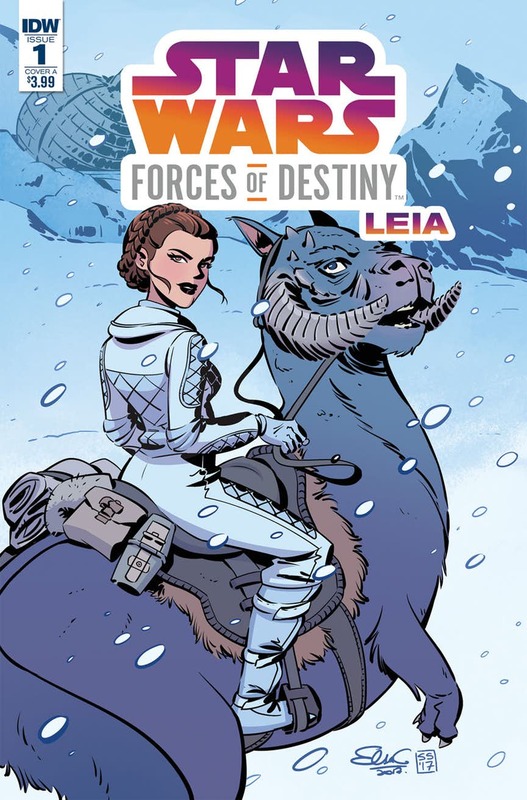 Star Wars Adventures: Forces of Destiny – Leia #1 is a nice little adventure story on Hoth that stars Princess Leia. From troubles with tauntauns to a run in with a wampa, it provides some action but also a good moral. Sometimes it’s not about how many times you fall down, but the last time you got back up. The adventures kicks off with Leia, Han and Hera out on tauntauns in search of a crashed ship that might have a part they need to repair the shields for the base. Along the way, Leia has some troubles with an unruly tauntaun that keeps throwing her off. This in turn leads to a nasty fall off a cliff, and a run in with a wampa. But no matter how many times Leia is thrown down or challenged, she always gets back up and strives to overcome everything that’s thrown at her. There’s also a nice redeeming moment for the tauntaun. It’s a fun story with a good lesson. The artwork by Elsa Charretier and Sarah Stern works pretty good. It’s cartoony, by stylish in its own way. With good artwork and a good story, Star Wars Adventures: Forces of Destiny – Leia #1 is an enjoyable read. I give it a five out of five nexus.